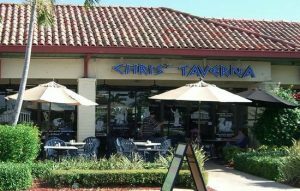 ***** Chris’ Taverna, 6338 Lantana Road, Lake Worth, Florida 33463, (561) 964-4233. Three months ago my husband and I retired and moved from Plainview, New York to Hunter’s Run Country Club in Boynton Beach. A couple of weeks ago, I came across jeffeats.com and love the site. You sure have a load of recommendations and I like the fact that you’re smart enough to know that food reviewing is a totally subjective call. Being retired we are really enjoy eating out almost every night. 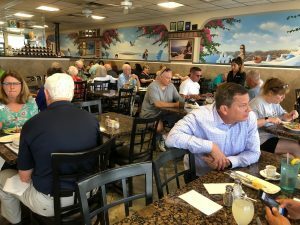 With that in mind, what’s your best call on a CASUAL GREEK joint within a reasonable driving distance of Hunter’s Run? Looking forward to following jeffeats.com for years to come. Here you go…and thanks for reading jeffeats.com. The food is terrific. The portions are huge. The service is terrific. The prices are amazingly reasonable. This is an absolutely terrific restaurant. My husband and I eat there at least twice a month. They have a meat platter (lamb chops, souvlaki, gyro) that is amazing. We usually split it and there has to be enough food for 4 people all for $27. If you want reasonably priced delicious Greek food, go there. You definitely won’t be disappointed. My 2 cents … don’t live near here and won’t ever check this place out. However I did look at the menu and it is mouth watering. The thing that caught my eye was the truly different dishes here. Every Greek restaurant has stuffed grape leaves. This place has rice filled and also beef filled. In addition they also have moussaka and pasticio (bad spelling). 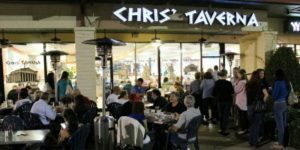 Having lived on Myconos over three summers and travelling extensively throughout Greece I find that Chris’ Taverna surpasses any Greek Restaurant in NYC where I was born and bred or Florida where I now reside..during season it is well worth any wait you may have!